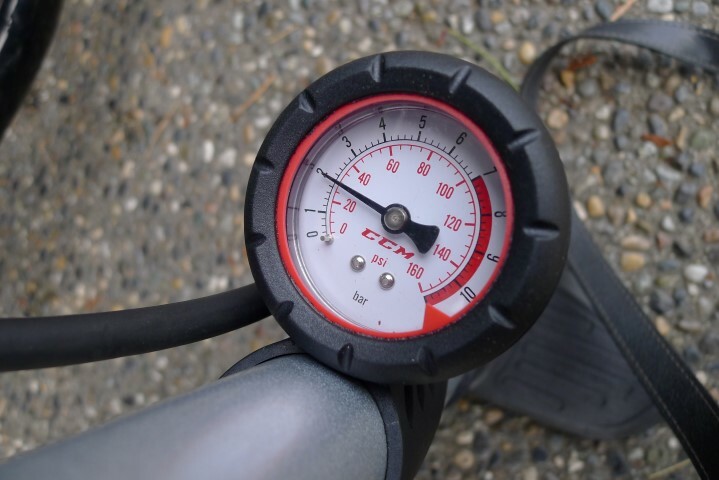 Having the correct motorcycle tire PSI for your motorcycle is very important. Not having the correct tire PSI affects the suspension, the feel of the ride, the longevity of the tire, and your safety. It is one of those tasks that gets overlooked or skipped due to laziness. I won’t blame you though! For most people having the correct tire PSI means going to a gas station. Finding the air compressor, finding 50 cents to use it, over filling the tire, bleeding out air, and then getting on with your ride. Let’s take the annoyance out of it. Let’s make it easy. If you make it easy you will do it. Before we begin please remember that you should fill your tires with air when they are cold. Air expands as the tire heats up and you will get an incorrect reading. The best time to put air into your tires is before your ride. If your one of those people that are always late, then schedule it into your phone the night before. I wanted to take my tire pressure monitoring one step further with a TPMS system. So I ordered the FOBO bike Tire Pressure Monitoring System (TPMS). This one seemed like a good place to start. It is $99USD and has a nifty app that connects via bluetooth. The app is very easy to use and straightforward, you can also change to the units of measurement you’re familiar with. The FOBO units replace the valve cap was an easy install. You may find the attachments to the valve stem a little big but that’s only because we’re used to the tiny caps. The only trouble I had was connecting it which was my mistake as I did not hold my smartphone directly on the unit. Once I was connected I was getting realtime PSI with tire temperature. It’s an added bonus to have the tire temperature as well. Now at anytime you’ll know you tire pressure. You have even less excuse to run incorrect tire pressure. I had a big day ride planned and it was going to be a hot day. An excellent day to put this to the test. I did have some concern about the attachments flying off at speed but that never happened nor did the units loosen in any way. Throughout the day I was seeing in real time how my psi levels changed and how the air temperature in my tire changed as well. On the track I did have some concern that units my fly off as I would be exceeding speeds of 250km/h (155mph). Did it happen? Nope. The units were just fine. I was able to track what my psi reading was between sessions so I always had the psi range I desired. The real world test was a complete success. It is incredibly easy to check your psi levels, not that it was hard before but I like making things easy. If it is easy, you’ll do it. Just open up the app on your phone and viola there it is. Mid ride check of your tires? No problem. This would be great for detecting small leaks as well. I really like the ability to see the internal air temperature as it gives me a good gauge on when my tires are warmed up. I used the FOBO system for several rides and a track day. It worked flawlessly. For a mere $100 this is a quick and easy mod. 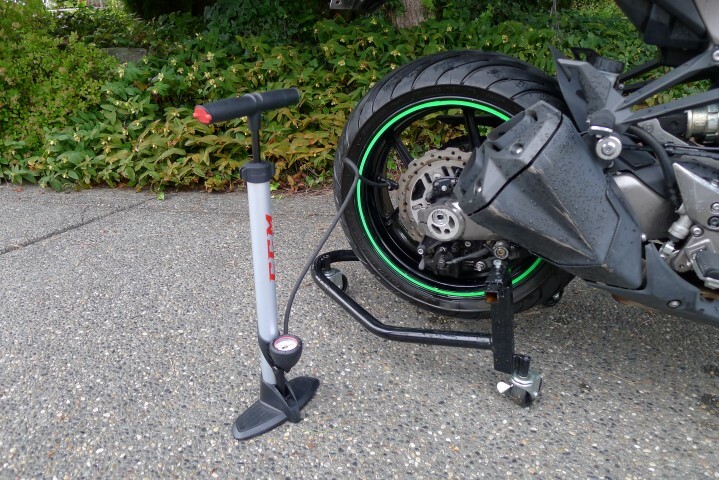 Now what is the easiest way to pump air into your motorcycle tires. Ladies and gentlemen, let me introduce you to the bicycle pump. Here is the first reason I love using a bicycle pump. It clips to the valve! Begone to trying to hold it at the right angle for the air to flow into the tire. Clip it and move on. Here is the second reason why I love my bicycle pump. It has a easy to read PSI gauge right on it! No need to find your lost fancy schmancy digital PSI gauge. Looks like I am a little low. I would like 36 PSI in my rear tire. Do you know what the correct PSI you should have in your tire? Consult your motorcycle manual and/or check the swing arm on the motorcycle. It should have a required PSI. 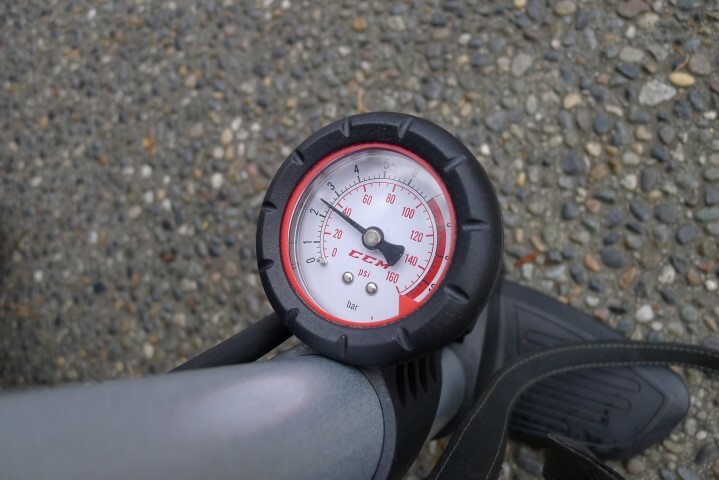 Note that the PSI gauge goes up to 160 PSI. It will never be a good idea to see if you can get it there. I think the same person that put that high number there is also the same person that puts the 280km/h speedometer reading on economy cars. Here is how the whole setup looks. Now begins the “work” to pump the air into the tire. This is where the skeptics come in and shout from the roof tops that it will take forever! If the tire was completely flat… Yes it would take several pumps for me to fill the tire to 36 PSI. Since we don’t ride around on flat tires, it took me 14 pumps to get the tire up to 36PSI. There we go! 36PSI. 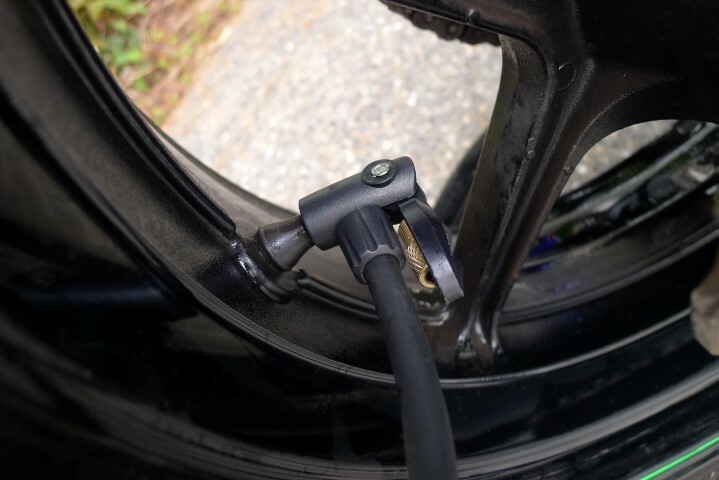 Even in full gear on a hot day I doubt you will break a sweat using a bicycle pump to keep your motorcycle tires the perfect PSI. There is no excuse for you to not have the correct tire PSI anymore. 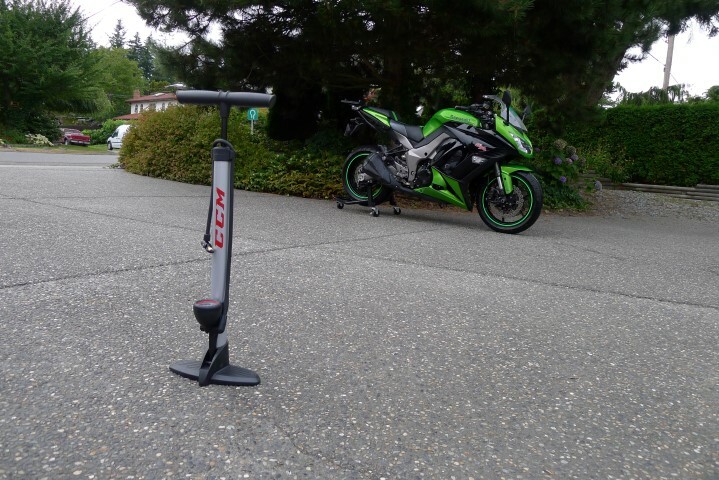 If you are interested in the specific bicycle tire pump I am using it is available at Canadian Tire for $17.99. email us at; info@1stgear.ca or click here!